Lebanon participated in the Voluntary National Review (VNR) at the High Level Political Forum (HLPF) 2018, presented its progress report towards achieving sustainable development, and had its Q&A session on July 18th, 2018, at the UN Headquarters in New York. 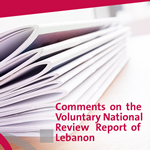 These comments, drafted by a group of civil society organizations, are intended as a contribution to the dialogue on the harmony between Lebanon’s international com­mitments to international institutions and donors, on one hand, and the achievement of SDGs, social justice, and equal­ity, on the other. Food is at the core of the nexus between identities, health, ecology and livelihoods, an intrinsic space where different important dimensions of life converge. Yet, policy discussions and deliberations that impact on food and food systems are often fragmented and incoherent. This article explores the close connection between these different domains and offers feasible pathways on how to place the virtuous interplay between sustainable and diversified local food systems and healthy diets at the core of the public policy agenda. It argues that turning to what is defined as the Peasant Food Web is the most effective strategy to address multiple intertwined challenges and offers concrete policy proposals that can facilitate the transition to agroecology and support peasants in feeding the world through a reinforcing loop between biodiversity, nutrition, health and livelihoods. Such a strategy requires significant efforts to ‘de-silo’ the current policy approach to what are often mistakenly addressed as separate challenges and break down the artificial boundaries imposed by the institutional settings that support each of the interconnected Sustainable Development Goals (SDGs). New York, Jul 30 (GPW) – Next September 24, the UN Secretary-General, António Guterres, will outline a new private investment strategy during a high level meeting that he is convening. Under the title of “Financing the 2030 Agenda for Sustainable Development” the meeting aims at building momentum and support to mobilize public, private, domestic and international resources, to improve financial norms and standards, and to disseminate to developing countries digital technologies to help them access finances. Details of the format and objective of the meeting were announced on Friday, July 27 by Deputy Secretary-General Amina J. Mohammed and Assistant Secretary-General Elliot Harris.